Why do I need a CuttingStation SS7? The best uses for the CuttingStation SS7 are: to keep the work off the floor, reduce noise, reduce dust, reduce trip hazards and maintain a mobile working area for all your cutting on site. How much does it reduce the noise by? 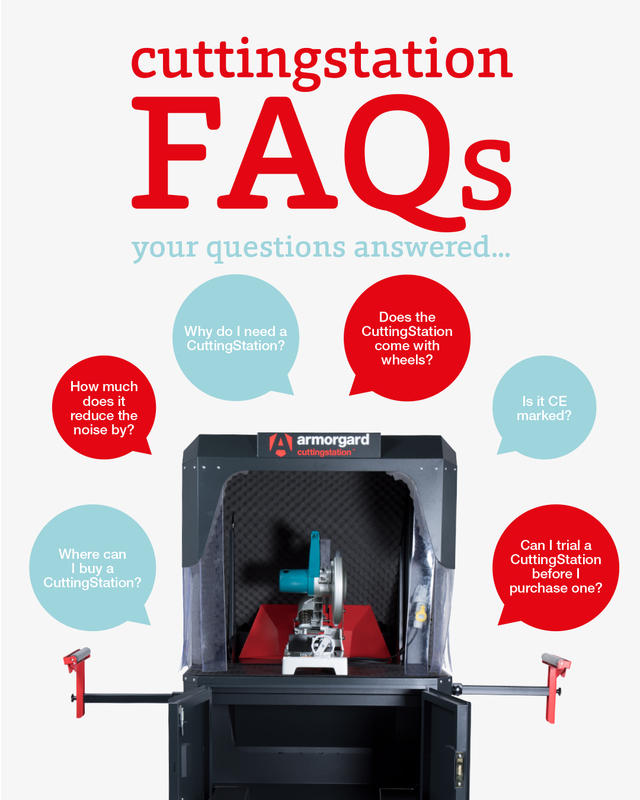 The tests have shown that the CuttingStation SS7 can reduce noise by up to 20Db for those within close proximity to the saw. It isn’t designed to reduce noise for the operator, but for others working around the operator. How do I overcome the issue of lifting heavy material up to the height of the CuttingStation SS7 workbench? An ideal product to assist with this is the PipeRack, this ensures material is kept organised and off the floor, as well as easily transferable to the CuttingStation SS7. Yes. The CuttingStation SS7 is fully CE marked. Does the CuttingStation SS7 come with all the electrics and light already installed? Yes. All electrics and the internal light are installed in the CuttingStation SS7 prior to the unit being delivered. Is the cabinet in the base of the CuttingStation SS7 lockable? Yes. The cabinet underneath the workbench is completely lockable using a highly secure locking mechanism. Does the CuttingStation SS7 come with wheels? Yes. The CuttingStation SS7 is supplied with wheels in a separate box, ready to be attached on arrival. Where can I buy a CuttingStation SS7? Can I trial a CuttingStation SS7 before I purchase one? What is the greatest challenge in the construction industry, productivity or R&D? Or are both inextricably linked? Can health and wellbeing bring about better results for construction companies?